Develop the foundation of Ba Gua Zhang as a martial art and internal energy system in three intensive weekends. Each day consists of 6 hours training with a one hour break in the middle. Ideal for beginning students who have little or no experience in Ba Gua Zhang, as well as advanced practitioners who would like to review the crucial foundational material that is the basis of all of Ba Gua’s techniques and methods. This class series is also a perfect fit for students in our Authentic Ba Gua Zhang online learning programs who want to take their training to another level. We are committed to making these classes equally valuable to experienced practitioners and beginning students alike. Standing meditation – “internal movement within exterior stillness” – is one of the most important parts of training in Ba Gua Zhang and the internal martial arts. Standing Meditation allows one to cultivate and actualize the body’s intrinsic energy and power. The Foundational Exercises open and loosen all the joints in the body, while connecting the practitioner with the body’s inherent spiral forces. The Foundational Exercises are the building blocks for advanced movements, and work synergistically with the second core practice – Ba Gua Circle Walking Nei Gong (Ding Shi). These five basic stepping patterns develop a flexible, rooted steps. Circle Walking Nei Gong develops Ba Gua’s unique circular footwork and internal stillness within external movement. Walking the Circle is a profound practice that lies at the very heart of Ba Gua Zhang’s internal energy development and martial techniques. Circle Walking Nei Gong strengthens the body and develops the circular, spiraling power that makes Ba Gua Zhang both an effective martial art and advanced energy practice. The 12 Standing Postures are a method of dynamic stance training that strengthens the entire body and stabilizes the joints. Each posture fully engages with spiral power configurations (wrapping, twisting, drilling, and coiling), which run through the body and produce integrated whole body power. The Ten Circle Walking Nei Gong Postures will be explored in detail. The 10 basic Circle Walking Postures open the different energetic channels, while also developing basic martial application. With the Single Palm Change, students begin their journey into the heart of Ba Gua Zhang. 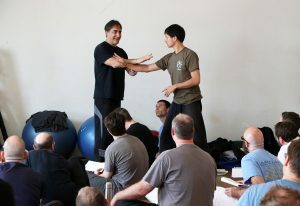 The Single Palm Change unifies all of the Foundational practices into a a single movement sequence that underpins Ba Gua’s many martial techniques and internal development methods. Senior masters of Ba Gua Zhang practice The Single Palm Change their entire lives, seeking and exploring its profound mysteries. An introduction to Tian Gan exercises, a unique Nei Gong set specific to Ba Gua Zhang that helps participants develop the circular wrapping, winding and spiraling internal power mechanics. The Double Palm Change develops Yin (Earth) energies, thereby complimenting the more Yang (heaven) energies of the Single Palm Change. The Yin and Yang energies of the body are now balanced. The Third Palm Change, together with the Single and Double Palm Change, are said to be the origin of all of Ba Gua’s infinite techniques and changes . The linear expressions of the Single and Double Palm Changes will be practiced alone and with a partner. Linear palms help to emphasize the body’s opening, expanding energies (Kai), which harmonize with the combining, closing (He) energies emphasized by Circle Walking Nei Gong. Class size limited – register today!